Cover Girl has fallen to pieces. Oh, Cover Girl, how I never really liked you. As female action figures go, there was always something off about this one. She had no accessories and was the driver of the Wolverine, a tank fitted with a pair of missile launchers. Her design, however, was just uninspired. The hair is very manly, her uniform a bland tan and brown. In the first G.I. Joe mini-series, she’s featured in a small role. Only in the series she’s got long flowing blonde hair and seemed to have a bit of attitude. There’s a promising character there. In the new comic book series she’s gotten an entire backstory in a rather well-crafted story. Fire and G.I. 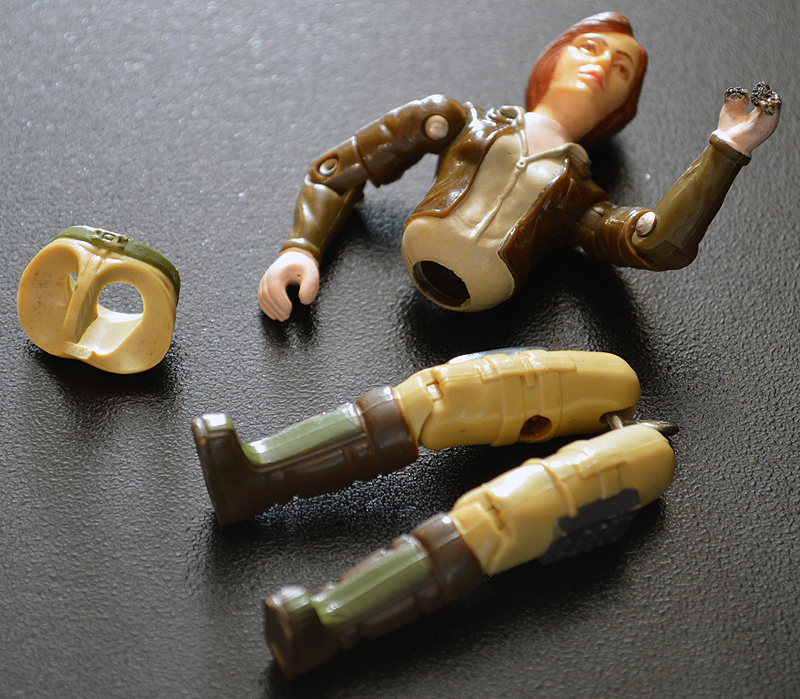 Joe action figures don’t mix. Yet this figure just never captured that for me. This explains the hand. 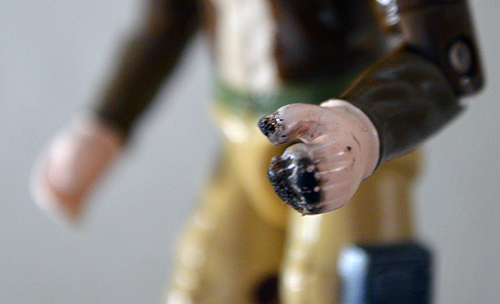 It’s not so much that I was into torturing my action figures. I never did this regularly. But my family’s house had a fireplace when I was younger, and I remember playing by it a few times. One of the times, I burned the hand on Cover Girl. I couldn’t have cared less about the figure, so I didn’t mind it being ruined like that. Plus it made for some dramatic play at the time. But don’t worry, I’m sure I’ll find a replacement arm soon enough and half her looking good as new.